I'm not one to comment a lot but I am apart of a book club that read A Thousand Splendid Suns earlier this year and it was a fantastic read! Truthfully, I really didn't want to read this book at first. I'm more of the murder mystery/suspense type book reader which is the exact reason why I got into a book club, so I could expand my horizons. This was a great book to read and provided a lot of thinking on my part and great discussion for our group. I really enjoyed the way that Laila and Mariam's relationship blossomed. I had a soft spot in my heart for Mariam after all that she had gone through in her life and never really truly being loved by anyone to finally having someone who actually did love her. I believe the reason why she didn't like Laila at the beginning was because someone was stepping on her territory even if it was a horrible existence. It was all she had to hang onto. All in all I think it was a very well written book and it made my heart break for the Afghani people and all the hardships they have had to endure. As for the book you are going to read this month, We Need to Talk About Kevin...my oh my. My book club just finished reading that book a couple of months ago and it was a doozie!! No one in our group has children and I don't believe any of us will actually ever have children so I'm very excited to hear your point of view on the book as well as others. It was one of those books that even after I finished reading it I thought about it for days on end. Good luck!! I haven't read A Thousand Splendid Suns in many years, so I don't feel particularly qualified to join in with the discussion questions. However, I did want to mention that the quote "A society has no chance of success if its women are uneducated" really caught my eye. I recently read Democracy in America recently for my European history class and Tocqueville argues for the same thing. I just find it really interesting to make these different parallels between texts. I got this book a few years ago after I had to read Kite Runner for school. I've read this book about 3 times since then. There is just a strong bond I feel the reader instantly has with Mariam. Amazing book and I cannot wait to read Kahled Hossein's recent release, And The Mountains Echoed. Maybe I will join 2014 - I love to read but don't have anything to keep me "accountable"
It's been years since I read this book, but I remember it being powerful but also SO hard to read. The pain these women went through was difficult to get through at times. And the thought that while it was fiction, women really did go through these things, made it worse. Thank goodness that it had a good ending! Khaled Hosseini is really an amazing writer, and I'm looking forward to (finally) picking up his most recent book soon! ATSS is one of my all time favorites, up there with Hosseini's other titles. I have to admit that when Laila and her baby were locked in the hot, dark room I had to flip to the end and make sure they made it out ok. I think his writing is so detailed and so real that I got completely caught up in the gravity of the situation. Loved. it. LOVE LOVE LOVE THIS BOOK! I'm currently reading his new release: And The Mountains Echoed. He writes such amazing stories! I read Thousand Splendid Suns three years ago and spent every minute of my time filled with heartache the whole time I was reading. It's such a brilliant book. Loved it! I read this book a few months ago and loved it. It is so well written. I thought it very strange it was written by a man, but that didn't distract me from the story too much. It made me think a lot more about the plight of women in other countries. Great book. And as for next month's book. WOW!!!! I need to commit to reading a long with your blog next year. I can't wait to see the book list for 2014. I loved this book. It was my favorite so far in our BBC (Bonnie's Book Club, as I like to call it). It was so moving and profound and made me ache for women who face situations like Mariam and Laila's. The final few lines of Mariam's story really got me. The lines read, "'Kneel here, hamshira. And look down.' One last time, Mariam did as she was told." I'm so glad we picked this book for a part of our book club! this is my favorite book. probably ever. i read it before i had my kiddo, and then again after, and it was a totally different experience. 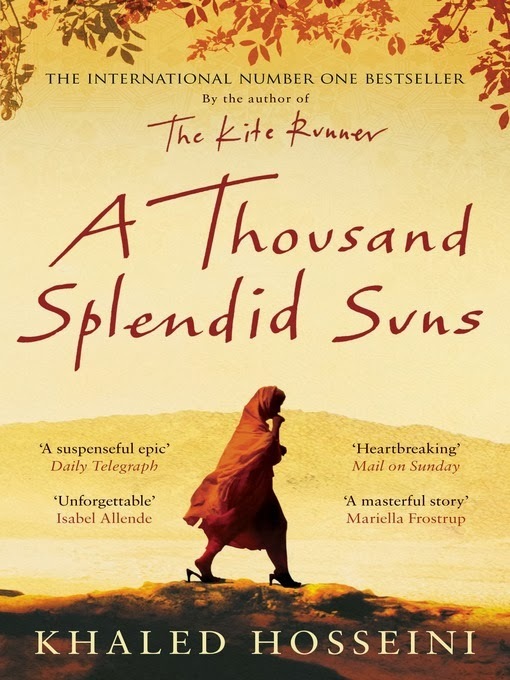 have you read hosseini's new one? i loved 'the kite runner' as well, so i'm looking forward to reading 'and the mountains echoed'.